My husband accused me of using Lola as a crutch late Saturday night. The fact that my immediate response was righteous (?) indignation, tells me he has a point. And perhaps, a good one. It's ok to be sad, it's ok to miss her, but I need to get unstuck. So, Sunday morning, I got up and cleaned the kitchen with a vengeance. Because it seemed like something to do. And I shredded documents. Lots of them. And got rid of a dead plant in the front room that has been dead for... months? Basically, I'm trying to get my living space to less resemble my emotional state - at the moment,both are cluttered and a little dusty. And I need to eat better, exercise more, and basically give my mental and physical states the reboot they so desperately need. 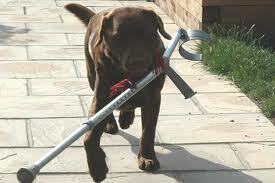 To say nothing of no longer using Lola as a crutch. Maybe I just need a therapy animal?